J. PIERPONT MORGAN. 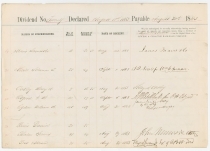 Partially Printed Document Signed, Dividends Paid to Stockholders of Oswego & Syracuse Railroad Company, August 20, 1863. J. P. Morgan signs twice, as attorney for stockholders Junius P. Morgan and “William H. Ogden” [William B. Ogden]. 2 pp., 13½ x 9½ in. Organizers formed the Oswego and Syracuse Railroad in April 1839 and surveyed the thirty-five-mile route that summer from Oswego, New York, on Lake Ontario, to Syracuse, New York, south of the Erie Canal. The original capital stock was 7,000 shares of $50 each. In 1847, the New York state legislature passed an act allowing the railroad to carry freight, so long as it paid tolls to the state. In 1853, the railroad consolidated with the Syracuse, Binghamton and New York Railroad. In June 1854, the stockholders authorized the issue of 2,800 shares increased stock to the original stockholders on a pro rata basis. 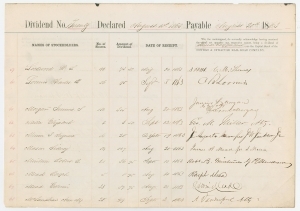 In 1863, the railroad earned $159,758 against expenses of $79,698. In 1864, earnings rose to $218,999 against expenses of $106,938. In that year, it had 6 engines, 10 passenger cars, 3 baggage, mail and express cars, and 51 freight cars, running over nearly 86 miles of track. During the fiscal years ending September 30, 1863, and September 30, 1864, the railroad paid out $39,228.50 in dividends each year. John Pierpont Morgan (1837-1913) was born in Connecticut and had a varied education at the direction of his financier father. He entered the English High School in Boston but soon had to leave because of rheumatic fever. He recuperated in the Azores for almost a year before returning to the English High School in 1853. After he graduated, he studied in Switzerland and at the University of Göttingen. He began his banking career in London in 1857, then moved to New York City in 1858. During the Civil War, he avoided service by paying a substitute $300. From 1860 to 1864, as J. Pierpont Morgan & Company, he acted as the New York agent for his father’s firm. In 1871, he partnered with Anthony J. Drexel, who served as a mentor to Morgan. In 1895, after Drexel died, Morgan renamed the firm “J. P. Morgan & Company,” but it maintained close ties with the Drexels in Philadelphia, his father’s company in London, and another in Paris. Morgan had many business partners but always maintained control of the partnerships. In the late nineteenth and early twentieth centuries, Morgan played important roles in the formation of General Electric, United States Steel Corporation, International Harvester, and AT&T. His company was also a major underwriter of twenty-four major railroads. He directed the banking coalition that stopped the Panic of 1907 and became the leading financier of the Progressive Era. His commitment to efficiency and modernization helped transform American business in the early twentieth century. Junius Spencer Morgan (1813-1890) was born in Massachusetts and began his business career in 1829 in Boston and demonstrated great business ability. He married in 1836, and his oldest son was John Pierpont Morgan. The elder Morgan was involved in dry goods importing and retailing from 1836 to 1853. During this period, he met London banker George Peabody and entered George Peabody & Company as a partner in 1854. Ten years later, Morgan became head of the firm and changed the name to J. S. Morgan & Company. During the Civil War, his firm sold war bonds in England, and his oldest son sent him reports of battles by telegraph before they were generally known in London. He remained in England until 1877, when he returned to the United States. William Butler Ogden (1805-1877) was born in New York and took over his family’s real estate business when his father died in 1825. He served as a member of the New York State Assembly in 1835, after which he moved to Chicago. In 1837, Ogden became the first mayor of Chicago, serving the customary one-year term until 1838. In Illinois, he was a leading promoter of the Illinois and Michigan Canal, then turned his attention to railroads. He was heavily involved in building several railroads throughout his life. He and a partner began the Galena and Chicago Union Railroad, which was immediately profitable in bringing grain into the city. During his career, he served as president or director of more than two-dozen small railroads. Originally a Democrat, Ogden joined the Republicans in 1860 but left again after a dispute with Abraham Lincoln over the timing of the Emancipation Proclamation. After Congress passed the Pacific Railroad Act in 1862, Ogden served as the first president of the Union Pacific Railroad from September 1862 to October 1863. He later helped found the second transcontinental rail line, the Northern Pacific Railroad Company. After the 1871 Chicago Fire, he left Chicago for New York City.